The stage loomed three entire blocks of seats away. I hoped my compromised – due to a hereditary ailment – hips would carry me that far in a very short period of time. 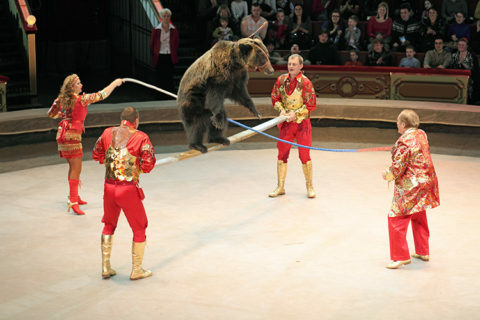 The performing balancing bear act of the Moscow Circus was coming to a close; the two brown bears wearing their incongruous, pitiful performing outfits were being prodded off the Toronto Sky Dome stage. The timing of our mission needed to be exact, right when the bears and their captors were off the stage and just before the human act came on. The banner I had hidden in the back of my pants was ready for action. “Now,” I whispered. LeaAnn Mallett, my courageous colleague, and I walked fast down the wide concrete steps, trying not to attract attention in the half light. 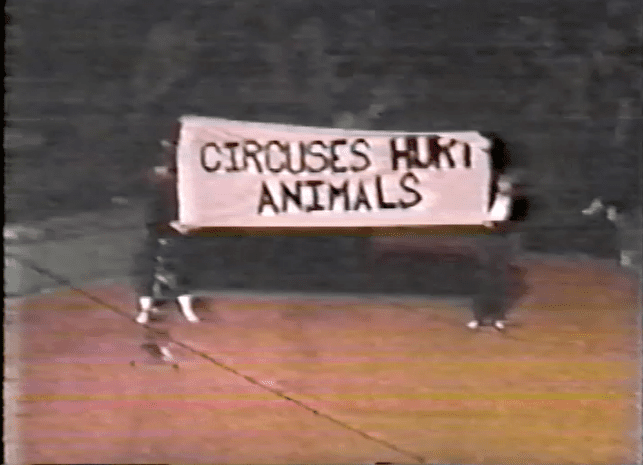 Adrenalin took over as we hurtled on to the stage and unfurled a seventeen-foot banner in nanoseconds “Circuses Hurt Animals” proclaimed the impossible to ignore statement. The piteous images of elephants, bears, tigers and lions showed us miserable shadows of their former wild selves, in cages, chains, being beaten and tied down. Today the former ticket buying public is educated enough to vote against animal abuse with their consumer dollars. This is evidenced by Ringling’s circus recent announcement of closing in May of 2017. 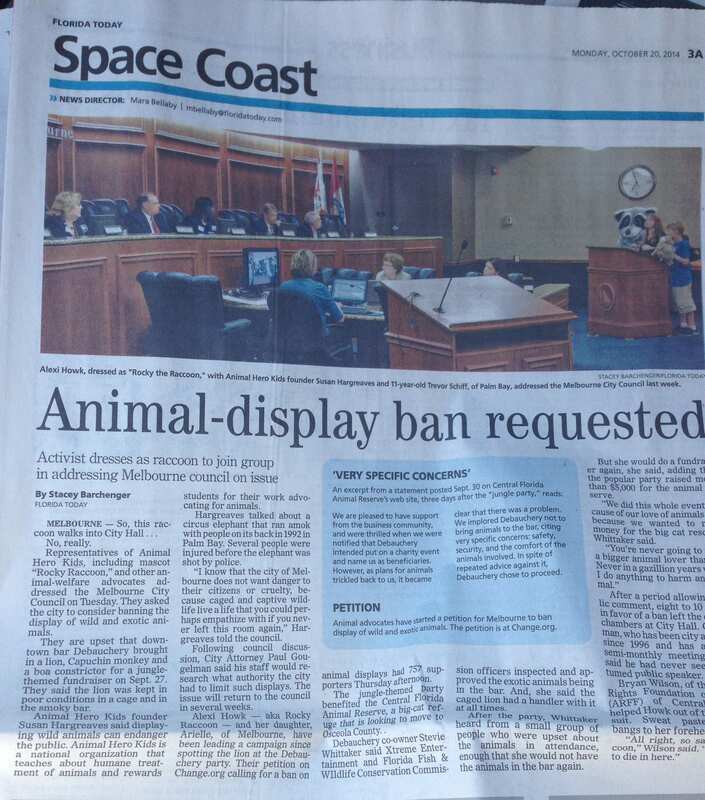 The recent signs of progress is only a segment of the tipping point against captive wildlife shows to come. In Animal Hero Kids school assemblies the young audience show their knowledge of other animals’ natural lives by answering the questions posed “If you were a bird what would your favorite thing to do be?” “Fly” they answer in unison. “If you were an orca, where would you want to live?” “in the ocean,” shout out the youngsters. It is only when the priority is profit margins this natural logic is interrupted, as in the case of aquariums, circuses and zoos.